Thanks to everyone who attended October’s Gender and Sexuality Network meeting! And… to Chris Foye, of course, for his fascinating paper! For the first time we were treated to a paper by a PhD student from a non Humanities background. 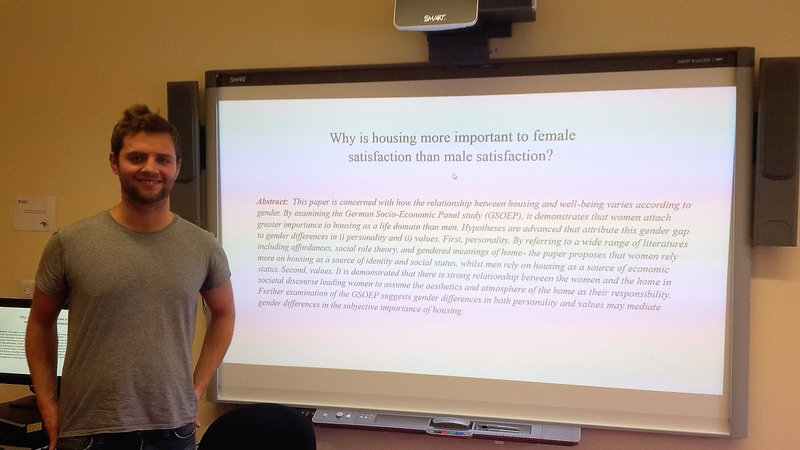 Chris Foyes’ paper examined a data set from Germany and drew conclusions on the relationship between gender and the importance of housing. For example, he drew parallels between the importance of housing for men with or without children, stating that the former considered housing to be far more important than the latter. For women, however, there was no change in their attitudes to their home when they became mothers. His paper lead to a series of questions about the role of a woman’s age in her satisfaction towards her house and also whether marital status was an important factor. The organisers of this group, Maria and Sophie, also questioned whether sexuality played any role in the importance people assign to their housing. We were unsurprised that data from the 90s did not include any statistics on this. Yanos Soubieski, who will be presenting at our next meeting on the 26th November, asked whether attitudes towards housing in the former East and West Germany had reflected the historical changes in the two regions. Chris responded that this was a very interesting question and that he would bear this in mind in the chapter upon which his thesis is based. Cultural comparisons were also made between German, English, Greek, French, and Arabic speaking nations. The audience offered their personal experiences of the ways in which male family members’ attitudes towards their home environment differed from female family members’ attitudes. According to the attendees’ experiences, it often seemed to be the case that the men viewed their houses more in terms of an investment than did the women, putting less emphasis on the appearance of the inside of the house than the women. We are now looking forward to Yanos’ paper “What’s wrong with Marxist Feminism? Taking the economics out of Marx” on the 26th November 1-2pm in the Graduate School. Look out for the abstract!